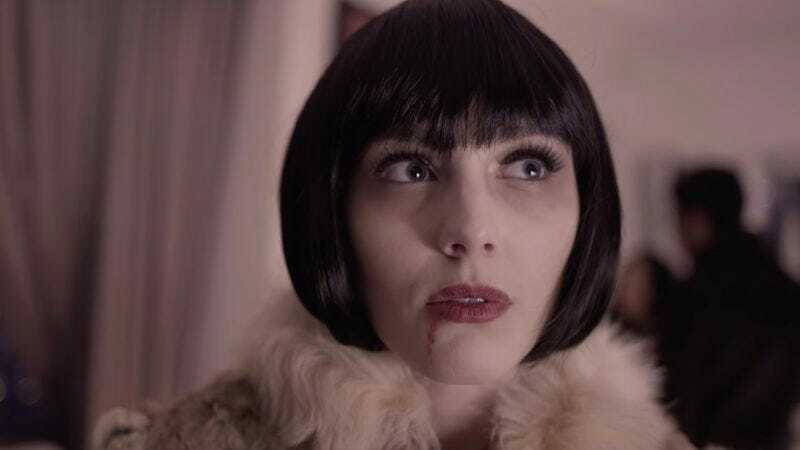 What if instead of a slick oilman hungry for wealth and power There Will Be Blood were about a high-society vampire who doesn’t realize the party she’s at is strictly BYOB (bring your own blood)? A new webseries called Full Movie Here rewrites famous films starring men into completely new stories centered on women. Each standalone episode will take on a different famous movie featuring a male protagonist and change the story, characters, and even genre, placing a woman at the center of it all. The series’s writer, Andrea Lee Christensen, hasn’t seen the original There Will Be Blood, so she’s imagining her own version going off the title alone in Full Movie Here’s first installment, now available on YouTube. The project is not just a fun take that goes so far left of what the original movie’s about to the point of hilarity, but it’s also trying to combat Hollywood’s rampant sexism—in front of and behind the camera. “There Will Be Blood” is directed by Christensen’s co-creator Toni-Marie Gallardo. Their own “There Will Be Blood” is a pretty stark departure from the themes of the original film, but it’s hardly the point to put down Paul Thomas Anderson’s work. They’re making something new and exciting and women-centric; the five-minute episode is funny and unapologetically over-the-top. Full Movie Here is currently seeking funding for future episodes, which include “Wolf Of Wall Street,” about a sexually frustrated werewolf and a tale about what it’s like growing up in a celebrity family like the Kardashians, titled “Finding Nemo,” because Disney is pretty bad when it comes to depicting women, too.